The most satisfying experiences do not cost any money. 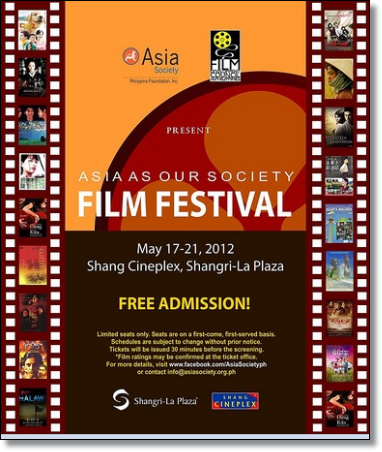 Enjoy Free Movies at Edsa Shangri-La from May 17 to 21, 2012. Shangri-La Plaza, together with the Asia Society Philippine Foundation Inc. and the Film Development Council of the Philippines, unveils the rich cultures of Asia and their compelling stories as it plays host to the first-ever Asian Film Festival, themed Asia as Our Society, from May 17 to 21, 2012 at the Shang Cineplex. You don't have to spend a penny when you watch these movies, but for sure you'll have a wonderful time after all the best things in life are free. Please note that screenings are for free but on a first come first served basis. Practical Tip: Please line up at least two (2) hours before the screening time of the film of your choice. This is a public service post. I am not compensated for this post. I just want to share this to you my dear readers! I believe that you could pay the kindness forward by sharing this information with your family, friends, classmates and relatives. Enjoy the movies! Pay the kindness forward! Thanks!